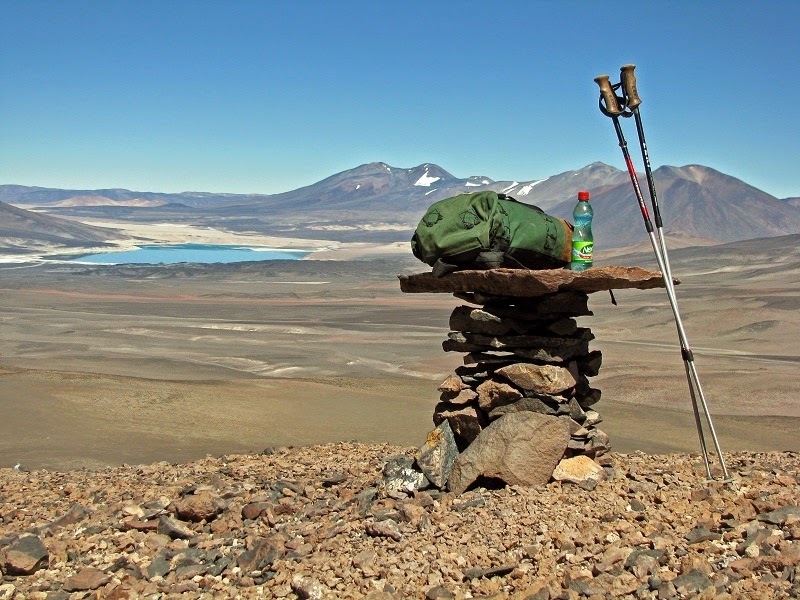 This is part 7 of a 31-part posting of my journal entries and photos from one of the greatest experiences of my life so far--a month-long mountain climbing trip to the Atacama Desert area of northern Chile and Argentina, which included summiting three 6000 meter peaks (~20,000 feet). To view all the entries in this series, check the posts labeled South America. Spent a couple hours building this 'tabletop' cairn out of a rather ordinary and broken-down original one at 17,000 feet on the trail up to Cerro San Francisco. The view is looking westward to Laguna Verde. The backpack is my trusty 1971 REI daypack, the one that later took me 4368.4 miles along the Appalachian Trail on my double thru-hike in 2012. That time I stayed up and ate four Reese’s Peanut Butter Cups. This last package (brought all the way from Maryland) was a bit of a mess, having been melted a lot. Through the night I had noticed that hollow feeling of hunger, which can cause poor sleep. It’s possible that my limited selection of food led me not to eat as much as I should yesterday. I have cravings for things like canned meats that the store in Caldera didn’t have. I should have taken the time to shop at Jumbo in Copiapó, but I was too frustrated with the ‘effectivo’ hassle (getting Chilean cash - I love that Spanish word for cash), and already way behind my desired schedule, so I wasn’t in the mood to appreciate that fantastic store. I hope I’ll have a chance to stop there on the way through on Wednesday. In any case, it seems that the Reeses made a difference, despite having caffeine and sugar. I slept more fully, though still not that restfully, after that. Outside the wind had never fully let up: It was very light, but steady. And as a result, the temperature had bottomed out at 31 degrees and it never got lower than that. I got some decent sleep, waking up to notice the moon had risen, but not checking the time. Then I started stirring as the horizon began to develop light. I actually got up and turned on the car at 6:20AM. I started up the laptop a few minutes later and let it warm up for a few minutes. Then I caught up on journal writing. The sun rose at 6:30 on the highest peaks and on those north of me not obstructed by any further eastward high mountains. I ate the last three Reeses and water for breakfast. I’m wondering whether it was colder and got calm down where I camped the night before or whether a change in the weather pattern is to blame for the difference between the 14 degree temperature down there last night and the 31 that it reached here. I suspect the latter. After eating I clipped my cuticles--a never ending battle with little sore spots around the sides and bases of the nails, especially when I’m not keeping clean. The sun hit the border markers at the pass on the highway at 7:15 and hit me at 7:35. I read Tolkien from then until 8:10, and did various chores after that, preparing and organizing and assessing gear. I checked my blister and found that the fluid had diminished though the skin had not broken. That's a great sign--it's healing easily. Outside the wind was a bit annoying, basically unmet expectations for a calm break in the morning. It really wasn’t blowing hard, but it made the morning chill quite uncomfortable. I dressed and put on sun screen and got on all my selected gear and packed plenty more and started up the trail at 8:22AM with modest breezes and warming temperatures. This was the lower part of the trail up to Cerro San Francisco. The lower portion of it is a rough jeep road. 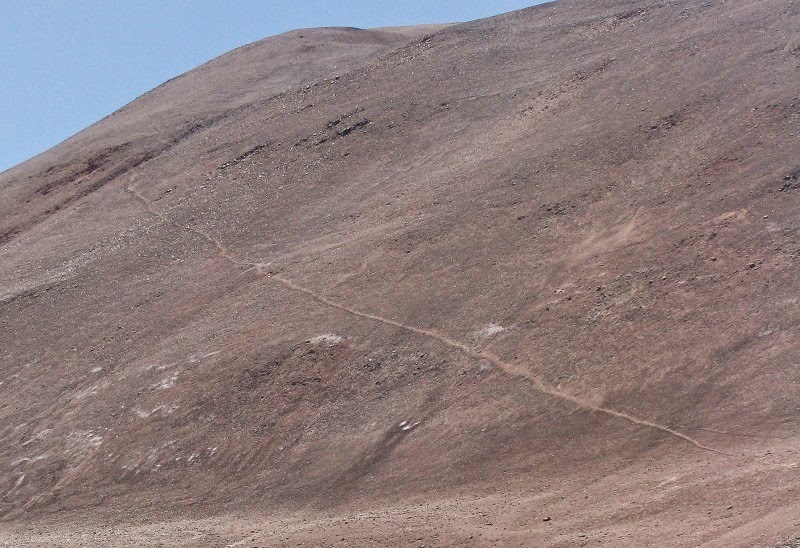 Farther up it becomes a very visible track sloping up the side of the mountain. I quickly found that my choice of layers was correct for the conditions. I trudged up and up to where the jeep trail ended at a cairn at the base of a steeper talus field. The route from there was not clear, but no other way except straight up that slope seemed logical. When I got to the top, breathing hard, I was at 17,000 feet and it was 8:45AM. There was a cairn there marking the trail onward across a saddle to another cairn where the slope seemed to drop off. But I rested at the first cairn and caught my breath then decided to linger there and 'play'. I set to work upgrading the cairn, just for fun. At first the work was really hard, because of the altitude, but soon I got into the effort and it was no harder than the work I’d done ascending the slope to that point. I definitely felt so much better today at 17,000 feet than I did two days ago. I actually felt energetic after the cairn building. My blister wasn’t troubling me, though I could feel the rubbing. After I set the ‘tabletop’ in place, made out of a huge flat rock 2.5 feet across on all sides but only an inch and a half thick, I took some photos (see the photo headlining this post). I left everything but my water bottle there, and wandered over to the other cairn. I was disappointed there to see a big drop before the trail started its clear diagonal trace up the huge impressive slope of the main San Francisco peak. That drop was at least 200 or 300 feet and could be more. But if I want to hit 18,000 feet tomorrow I’ll have to descend first to do it. I climbed a little peak closer to the pass to survey other possible options -- there were none. Then I headed back down to my car, making good time and having nothing to report other than the fact that the wind was now picking up. Here's what the car looked like from a vantage point on the jeep trail on the way back. 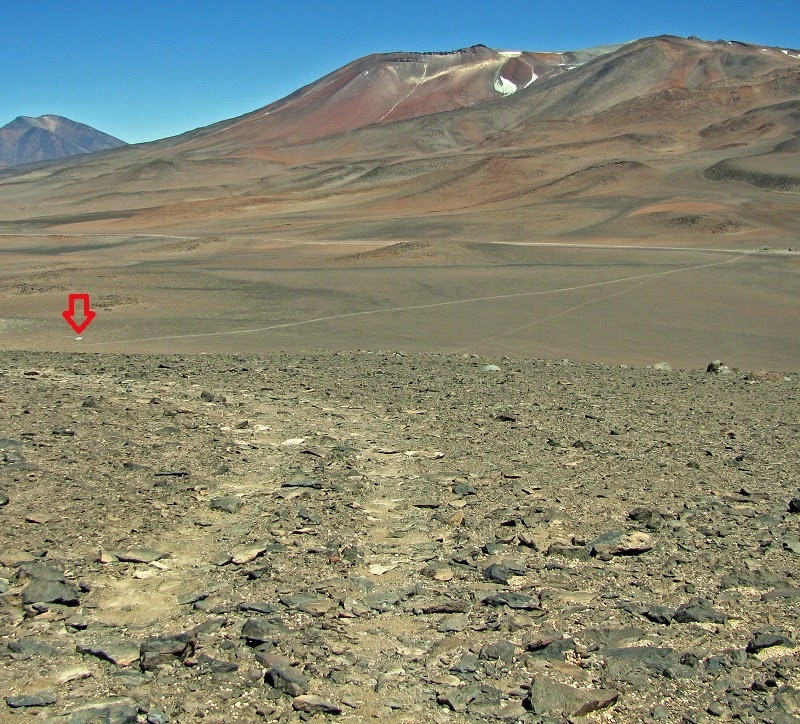 The Chile-Argentina border markers are at the far right, and the highway is visible running from there roughly horizontally across the scene. I got back to the car with a steady wind blowing at 12:15 and nestled into the car and changed and set up sun shading and checked, cleaned and tended my blister. The skin had broken but the foot wasn’t sore to the touch or red. I put on more Neosporin and a fresh bandage to help it heal until I abuse it again tomorrow morning. I got out my camera and looked over the new photos. Though it might sound surprising, I was enjoying this solo camping out of a compact car. I finished the last of the second water jug and calculated that I'm using a 5 liter jug every 1.5 days. So I should be fine tomorrow, but may not have enough water to do a little training hike on Wednesday morning before I leave. I actually considered leaving for Copiapó right after my major hike tomorrow, but quickly thought the better of it because I want to have the extra night at altitude for acclimatization. I got on the laptop at 1:40 and started catching up on my journal as the usual afternoon wind whipped around outside and as I sat in a little cocoon of shade made by putting up shirts and jackets over the windshield and the driver’s side window. Writing work was done at 2:20 then I downloaded the new photos and processed them. I got off the laptop at 2:40PM and tended to some chores and made myself some milk and Ovaltine. I had developed a headache of a familiar kind while on the laptop--not related to altitude. It is the kind that develops when I’m over-tired but refuse to rest or even slow down until I’ve finished the task at hand. Probably the squinting and concentrating at the laptop screen added to the problem. But by the time I was off the laptop it was a significant factor in how I felt. I drank most of the Ovaltine and rearranged things a bit in the car then finally just reclined the seat and relaxed. And the headache vanished almost immediately! Why I put myself into that obsessive mode, without even being aware that I’m headed into it, I do not know. I rested and got some sleep from 3:20 to 4:45 then got up feeling refreshed. The wind was howling--almost as bad as two days ago and definitely worse than yesterday. I started reading Tolkien at 4:45 and read until 6:35 when I took a break and went outside. I noticed eight vehicles parked parallel to each other out at the highway on the Argentina side at the pass. As it turns out they were a large hiking group here to attempt to summit San Francisco Peak tomorrow (see tomorrow's entry). I read Tolkien at 7PM. I read to 7:30, ate some good Chilean cheese crackers to 8:00, and read until light faded at 9PM. When the sun set on my car at 8:20 I got in my sleeping bag and put on mittens to keep me warm while reading. I sat in the waning twilight and just watched it get dark until 9:30 when I reclined the seat, but remained awake, probably for another hour or so.